America loves trucks — one look at annual sales figures or five minutes on the streets of any small town will confirm this. As a result, there’s plenty of excitement surrounding the launch of this all-new Ram 1500. Everything from the exterior styling down to the chassis and powertrain have been updated, and based on our first look, this is likely the best truck that Ram has ever delivered. 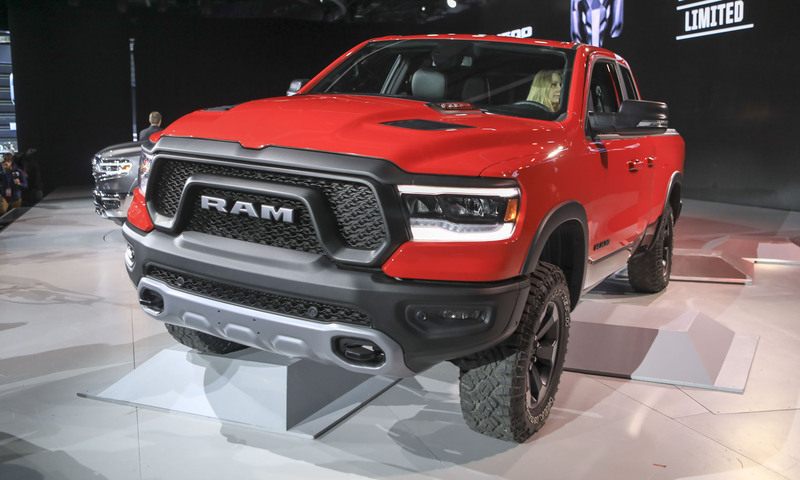 Ram trucks have consistently held their position as the third-best-selling vehicle sold in America, outdone only by the Chevrolet Silverado and Ford F-Series — the other formidable players in the U.S. full-size truck market. However, coming off a second record sales year, the folks at FCA are hoping this new model will further increase the brand’s sales momentum. Not only does the new Ram have a stylish updated look, it offers more capability, better fuel economy and an impressively innovative interior. 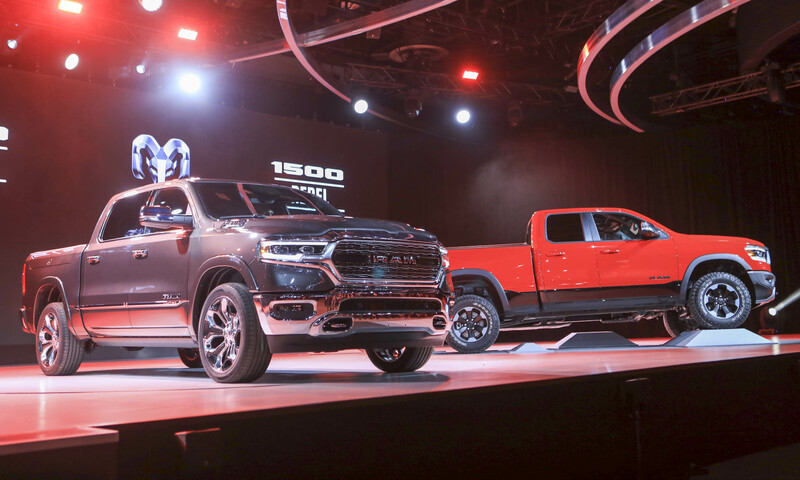 It can be a dangerous game when redesigning a brand’s best-selling model — clearly there exists a large number of consumers who like the truck as it is. But with this redesign Ram owners should not be disappointed — the new model is still easily recognizable as a Ram. 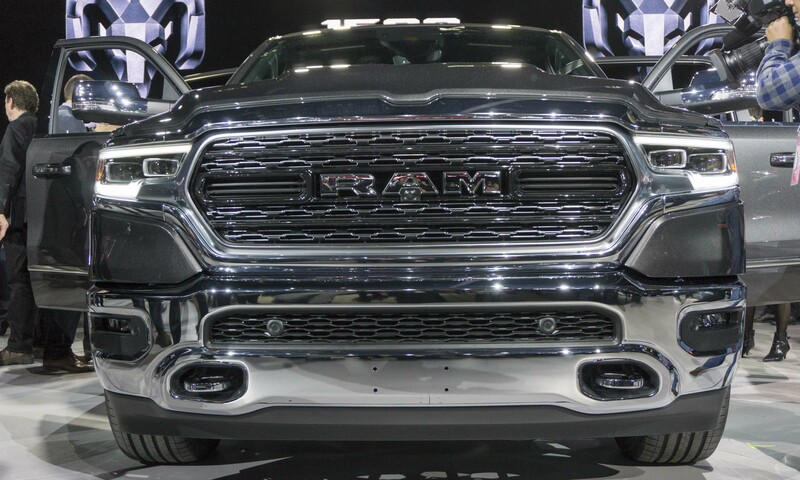 To dissuade any doubts, the name RAM is spelled out in a new elongated font across the grille of every truck. The new Ram has a more aggressive look than past models. The bold grille is forward leaning, giving the indication of motion, and the new truck is wider than the previous generation. Fog lights are pushed to the edges, giving an even wider and lower appearance. There are six different grille styles, none of which feature the classic Ram crosshairs. Ram trucks now have three different headlamp variations: halogen, full LED and full LED with an Adaptive Front Lighting System. The AFLS system rotates the lights up to 15 degrees in the direction of travel. The LED headlights are narrower and better integrated into the grille than the halogens, giving the Ram a premium look. 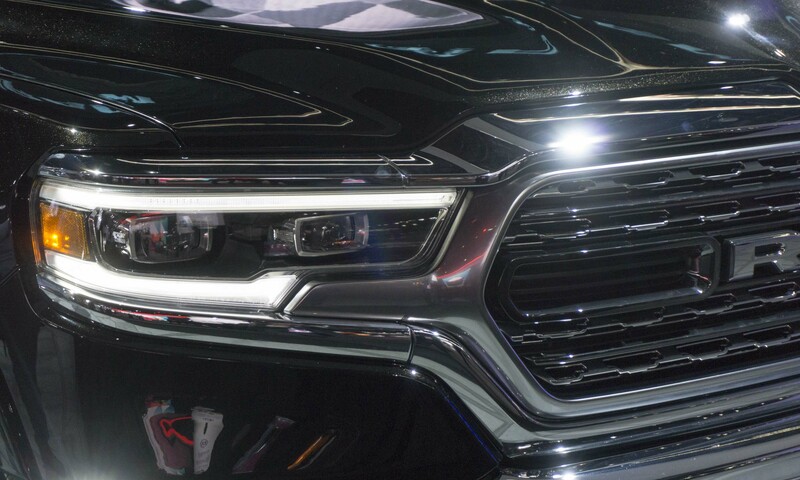 They also feature new signature LED daytime running lights. 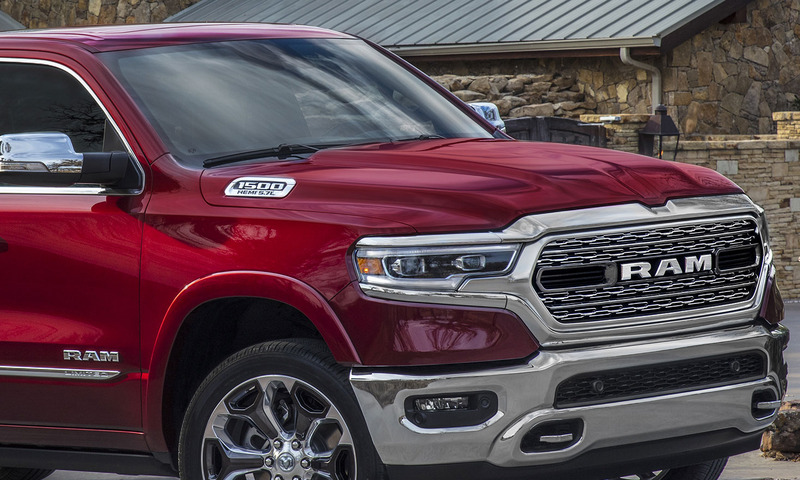 The 2019 Ram features a new aluminum hood that is raised to give the truck a big-rig stance. 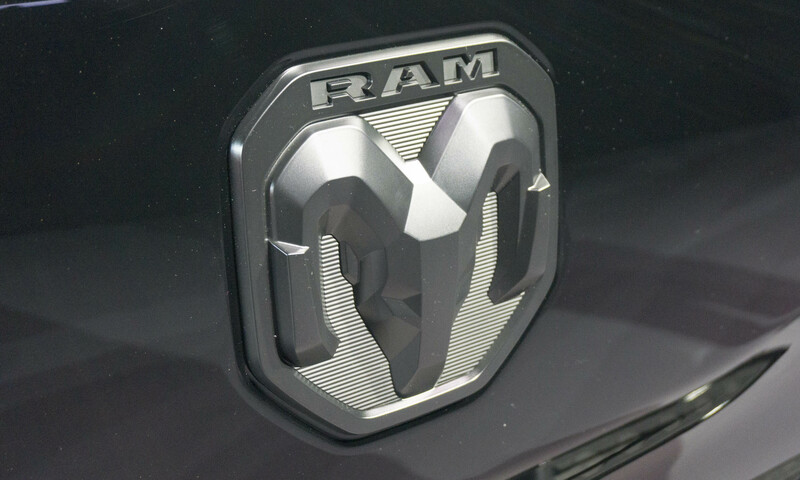 Rather than putting badging on the side of the truck to indicate the powertrain, Ram designers gave this badge more prominence by placing it on the side of the hood. 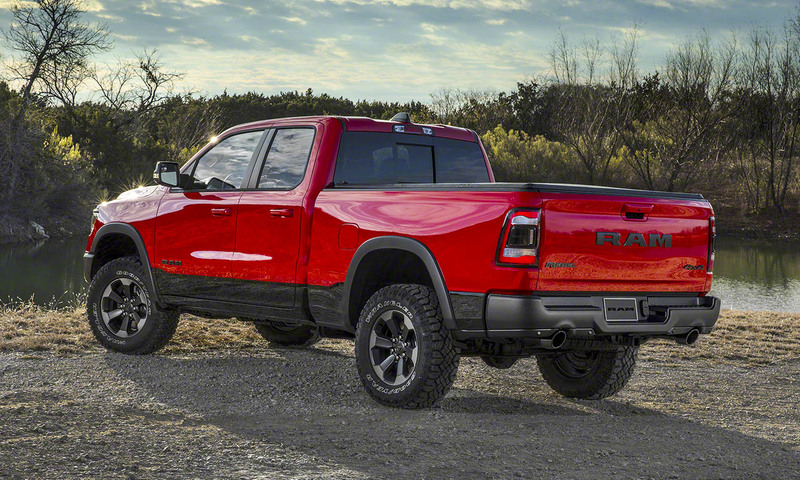 It seems odd to think about a pickup truck in terms of aerodynamics, but much of the Ram’s new look was designed to help the big truck slip through the air with a bit less drag. 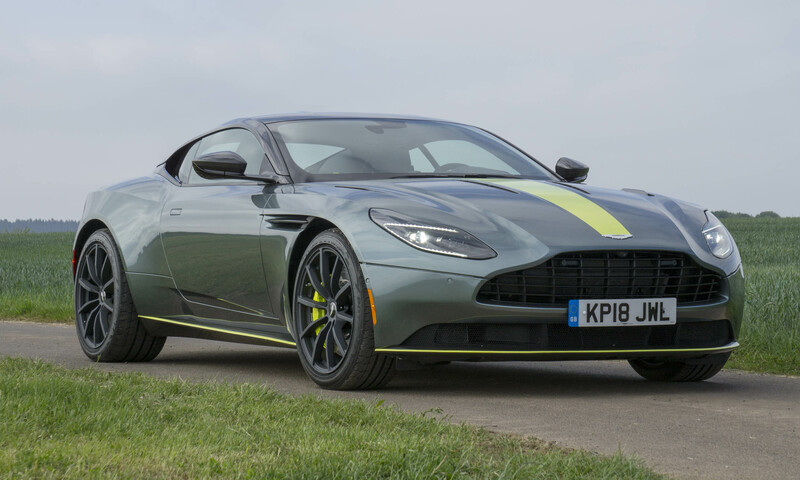 At the front is a deployable air dam that automatically lowers at 35 mph to improve airflow. Trucks equipped with air suspension lower themselves at highways speeds. 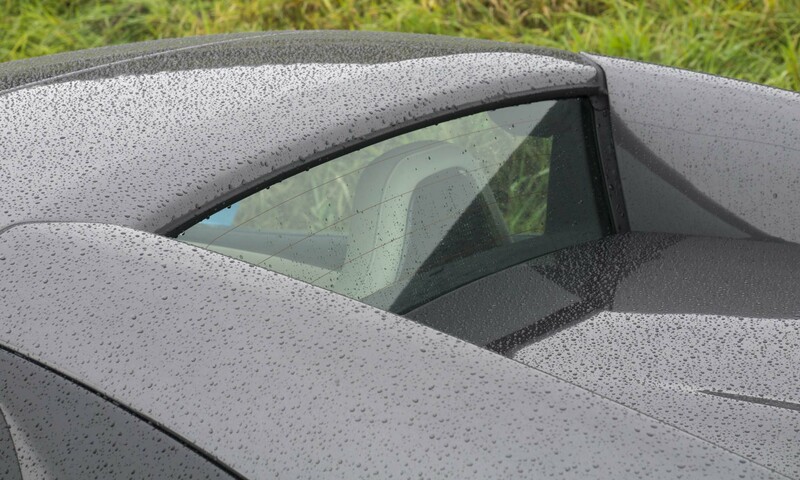 There’s also active grille shutters that can reduce airflow through the grille when cooling isn’t needed. 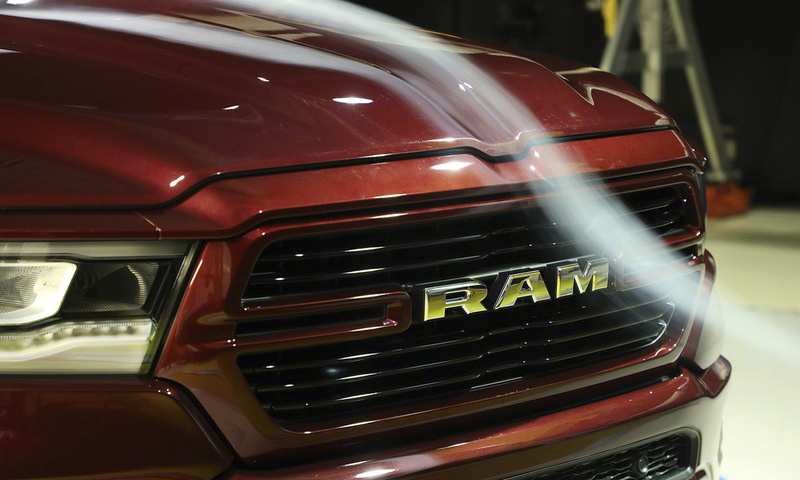 The raised hood of the 2019 Ram optimizes airflow over the windshield, reducing drag as well as wind noise. Grooves in the roof channel the air over the truck bed to a rear spoiler integrated into the tailgate. Raised bed rails have been raised to further reduce drag as air flows over the vehicle at speed. Fuel economy can be further improved with an optional tri-fold hard tonneau cover. 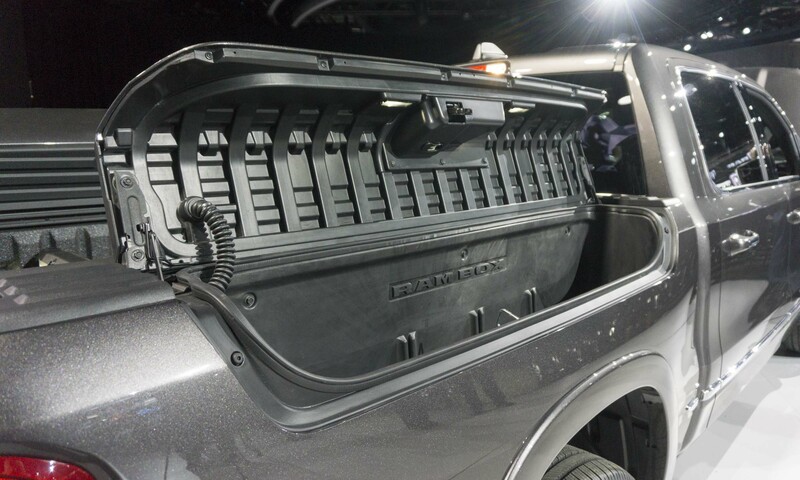 The innovative storage units built into the sides rails of the truck bed have been updated for the new model year. The RamBox now features a 115-volt power outlet as well as lights integrated into the box lids for better illumination. The storage boxes are also lockable, weatherproof and drainable, adding considerable cargo-carrying versatility. The new Ram will be available as a Quad Cab or Crew Cab; the latter offers one of the most spacious cabins in the half-ton truck segment. 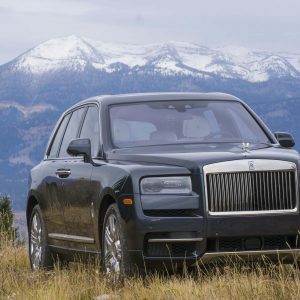 A variety of interior treatments are available depending on trim level, ranging from a basic vinyl bench seat in the Tradesman to premium leather bucket seats with heating and cooling in the top-level Limited. 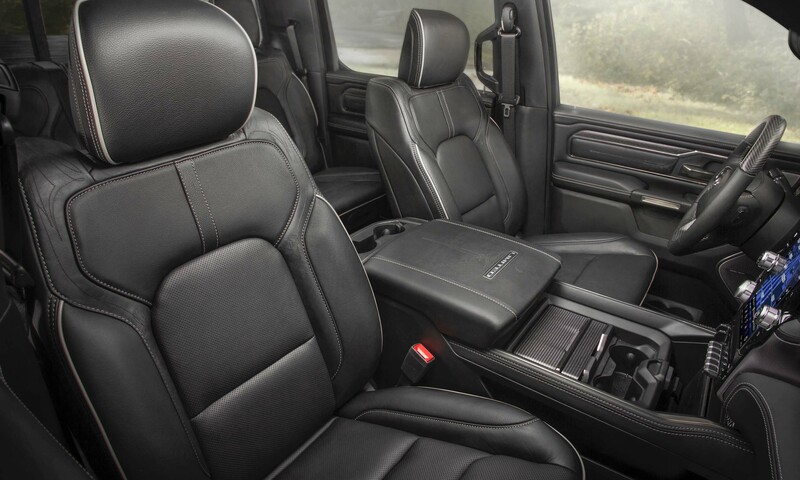 The most common seating surface will likely be cloth bench or bucket seats in the Ram Big Horn. 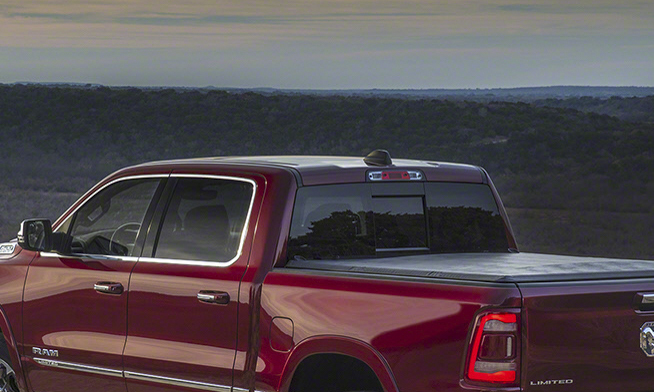 Designed for work or play, the Ram 1500 can be equipped with several power outlets throughout the cabin. 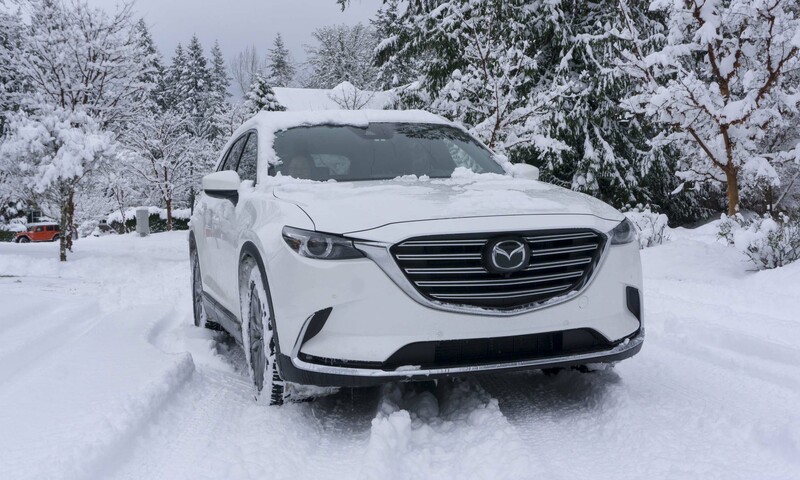 All trim levels come standard with two 2.5-amp USB outlets in front with full functionality, as well as two more in the center that operate as power outlets. The higher trims also come with two additional 2.5-amp ports in the rear-seat area. Also available is a three-prong 115-volt outlet in both front- and rear-seat locations. A wireless charging pad for properly-equipped smartphones is also available. 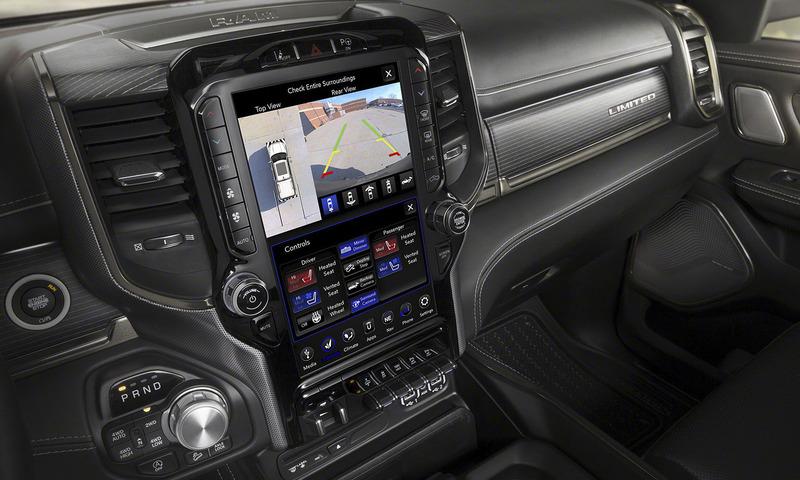 Ram’s latest generation Uconnect system is one of the interior’s standout features when equipped with the 12-inch touchscreen display with split-screen capability. This vertical display is bright and easy to read and can be configured in a many ways. The system is set up to run Android Auto or Apple CarPlay and offers 4G Wi-Fi hotspot capability. Also available is a 360-degree birds-eye camera view — an extremely helpful feature when trying to maneuver a large pickup truck. The Ram 1500 can also be equipped with what FCA calls the most powerful factory audio system ever offered in a pickup truck. The optional Harmon Kardon audio system features 19 speakers, a 10-inch subwoofer, active noise cancellation and a 900-watt surround-sound amplifier. 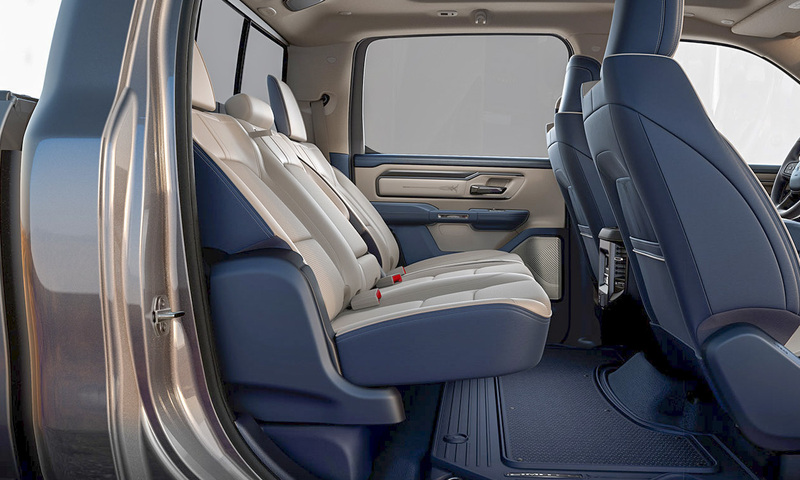 The 2019 Ram 1500’s rear seat offers more comfort and utility than ever before. When properly equipped, the seats can recline up to eight degrees while providing an impressive 45.1 inches of legroom. 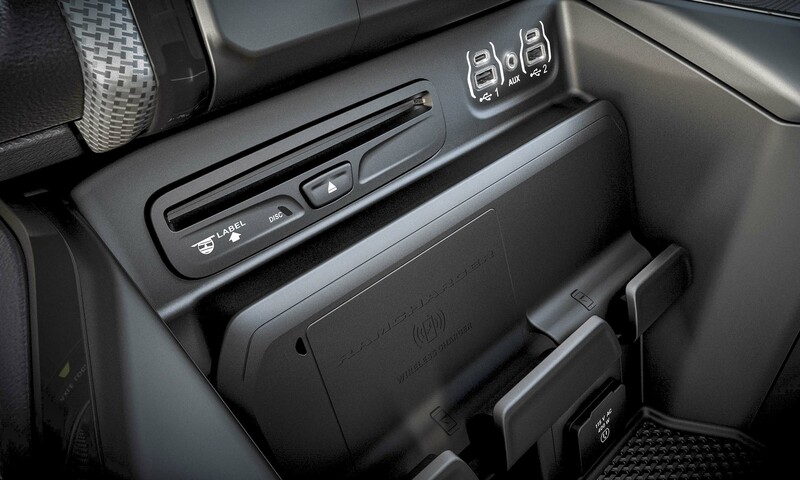 Rear seat bottoms can be folded out of the way to take advantage of the flat load floor, or additional storage can be found in the two under-seat Ram Bins. 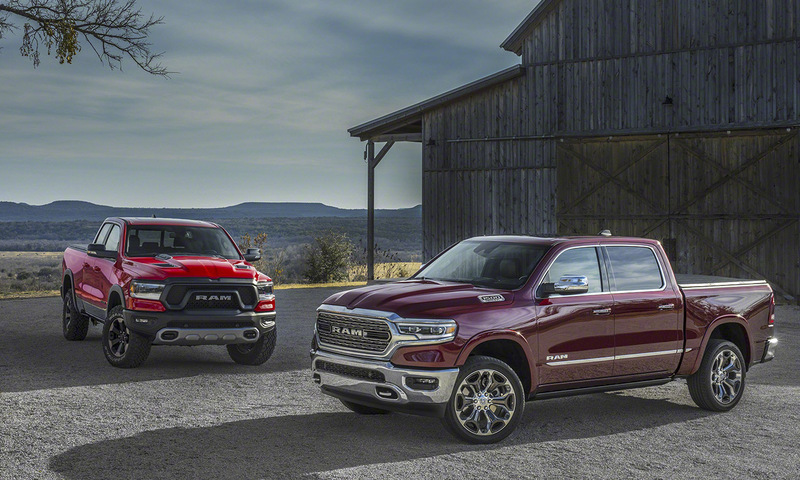 Although the added comfort and convenience features are important to many buyers, the Ram remains first and foremost a pickup truck. 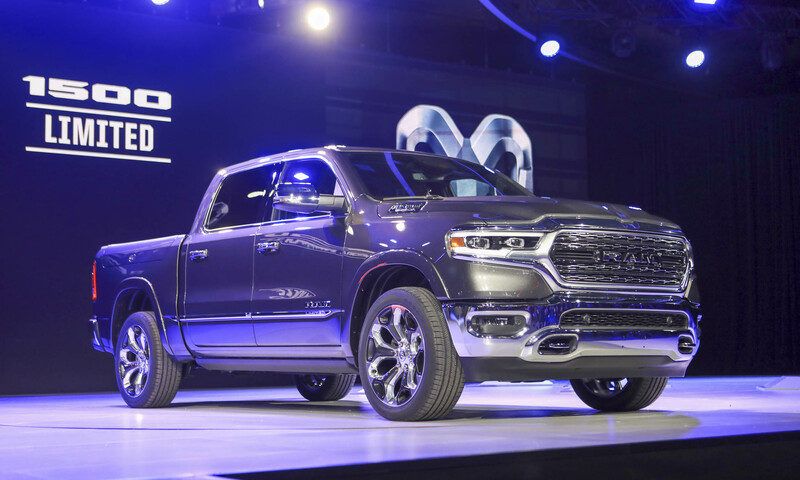 To that end, the 2019 Ram 1500 rides on an all-new chassis that is not only 120 pounds lighter than the current generation, it is made of 98-percent high-strength steel. 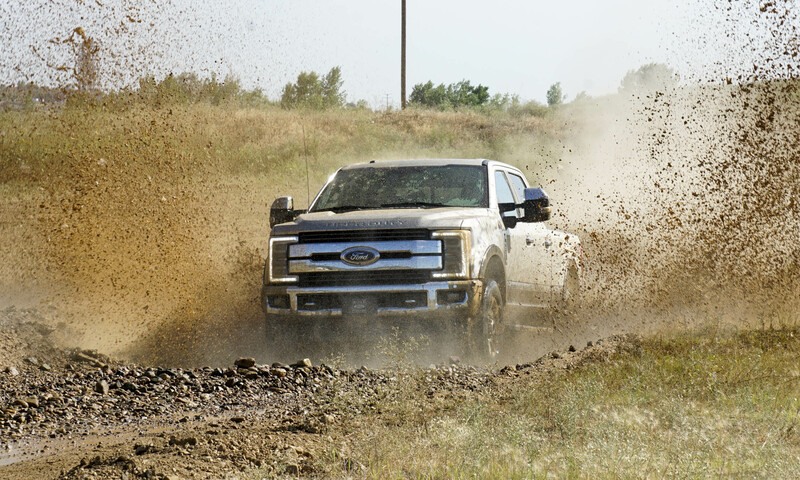 This new chassis is designed to be safer, quieter and offer more capability then ever before. The Ram will initially be available with a V6 and V8 powertrain, and both will be equipped with the eTorque mild hybrid system. This system combines a belt-driven motor generator unit with 48-volt battery pack which offers seamless start/stop function as well as a short-duration torque boost to the engine crankshaft in certain driving situations. Torque can also be added during gear changes which minimizes noise, vibration and harshness. 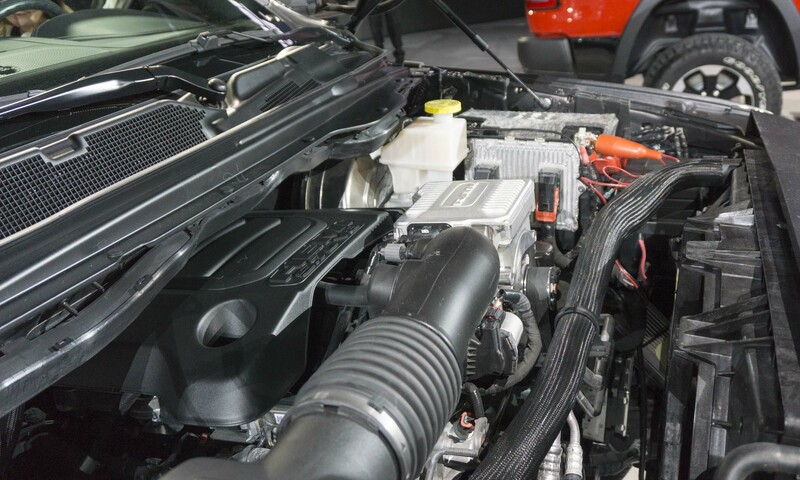 The base engine on the new Ram 1500 is the 3.6-liter Pentastar V6 producing 305 horsepower and 269 lb-ft of torque. This will be the standard engine on most configurations. The V6 will come standard with the eTorque system. Of course, the Ram 1500 will also be available with the 5.7-liter HEMI V8 engine that puts out 395 horsepower and 410 lb-ft of torque. 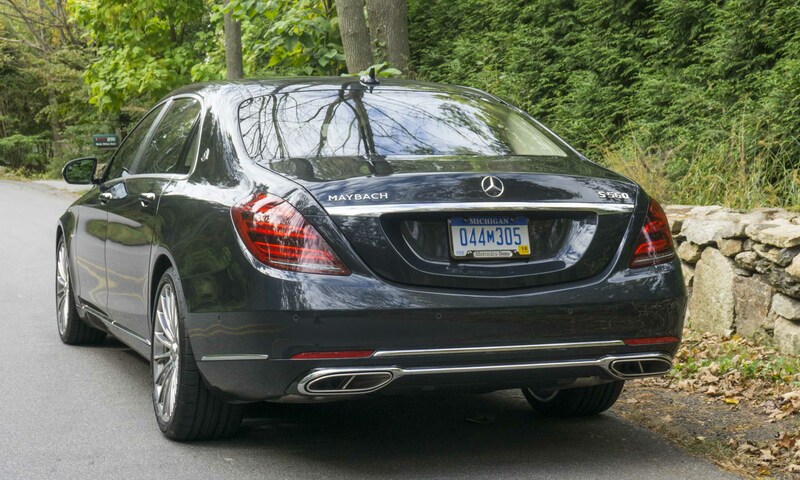 When the load is light, the V8 can deactivate half its cylinders for improved fuel efficiency. 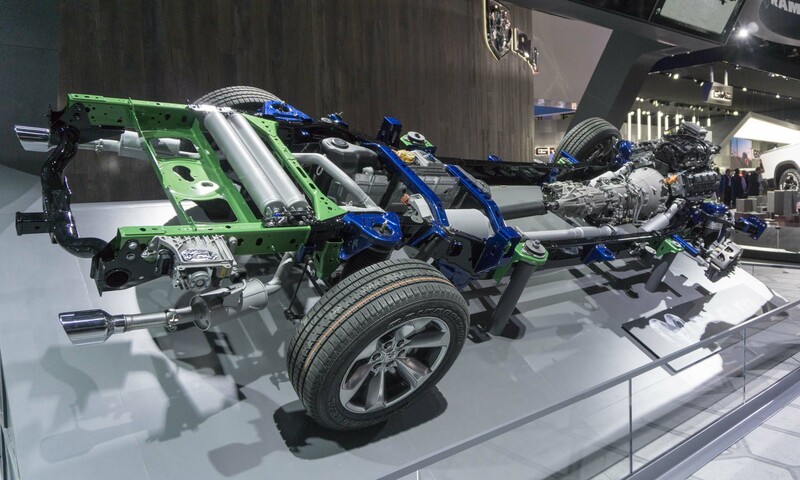 Engineers added active vibration dampers mounted on the frame as well as Active Noise Cancellation technology in the truck cabin to further smoothen the transition between 4- and 8-cylinder operation. 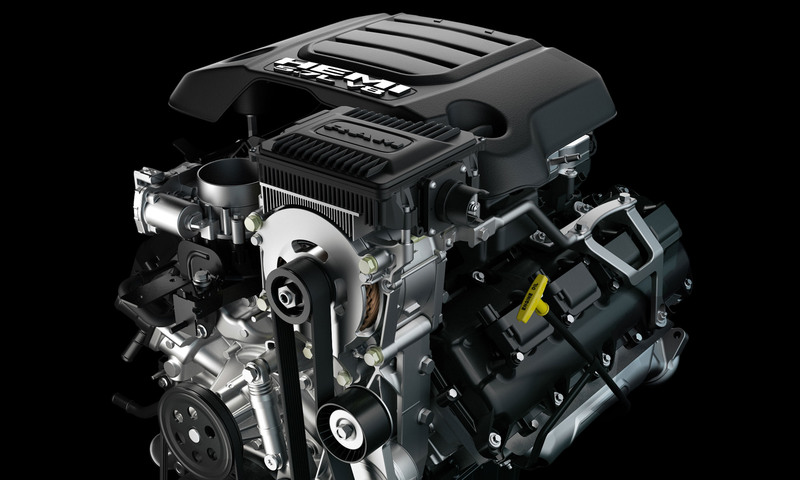 The HEMI V8 can be had with or without the eTorque system. The V8 will be the first engine available at launch, followed soon after by the V6. 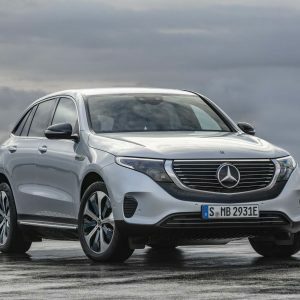 A new diesel option should be available sometime next year. 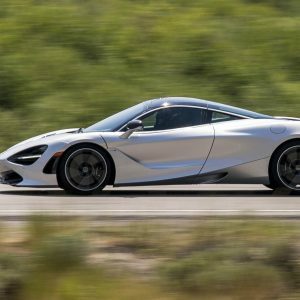 Both engines are teamed with an electronic TorqueFlite 8-speed automatic transmission. 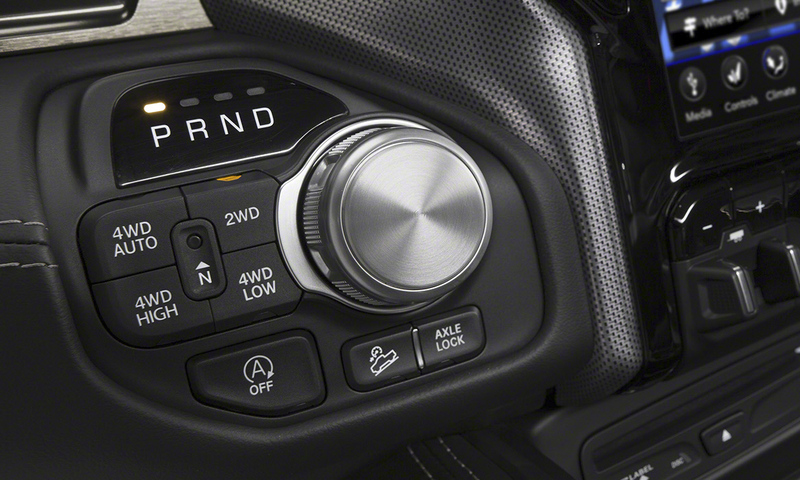 The rotary shift dial is mounted on the left side of the center stack in the instrument panel. The new chassis combined with the updated powertrains gives the Ram 1500 some impressive capabilities. Maximum payload is now 2,300 pounds and, when properly equipped, the new truck can tow up to 12,750 pounds. 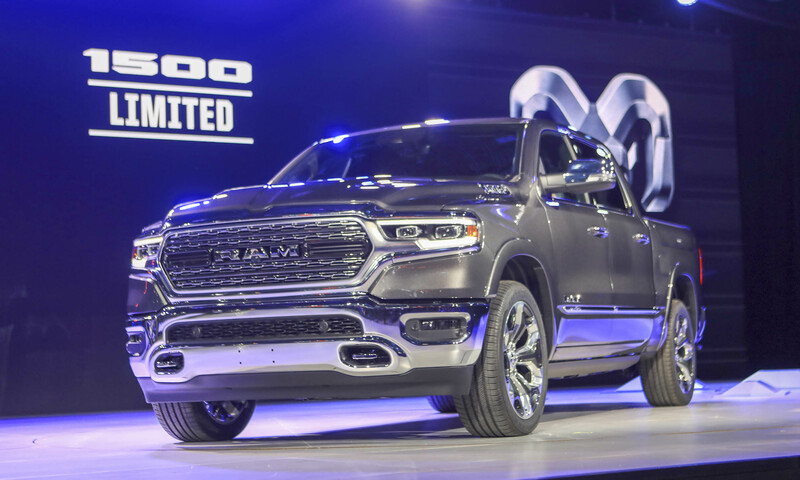 The 2019 Ram 1500 will begin arriving in showrooms in February.